Newcastle boss Bobby Robson paid 拢7million for Cort in the summer of 2000 and Cort now plays for UD Marbella! No doubt most football fans are aware of the new management structure of the Marbella Football Club and the new signings who have been joining the club over the last few weeks. Carl began his career as a teenager with Wimbledon. He scored in the first minute of his full debut against Newcastle United in 1997, which soon followed with a place in the England under 21聮s. He is tall and he is fast. 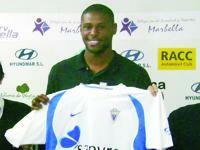 The signing was finalised shortly before the close of the Spanish transfer window at midnight on the 30/01/08. We asked Carl the obvious questions: who was he playing for last and why now, why Marbella. He told us that he left Leicester City on account of his past injuries to his knee and ankle that still persist on plaguing him. He is no stranger to the Costa del Sol and as he was medically recommended to try a warmer climate, it did not take much to tempt him to join the Marbella Football Club. He is hoping that the climate and the more relaxed lifestyle will be beneficial to his performance. He told us that he has always been a keen follower of Spanish football and that he quite likes the idea of playing abroad. 聯It聮s a good test for me聰 he said. 聯I have not come here for fun and to enjoy life, I am giving this 100% of my effort to achieve success. I would like my move to be permanent聰 he stated. Although he has been with his girlfriend for the last 5 years the move was quite sudden and she still lives in London for the time being, but they visit each other regularly. Both his family and hers also live in London. He told us that his older brother, Leon Cort is currently playing for championship with Stoke City. We wish Carl every success with UD Marbella.